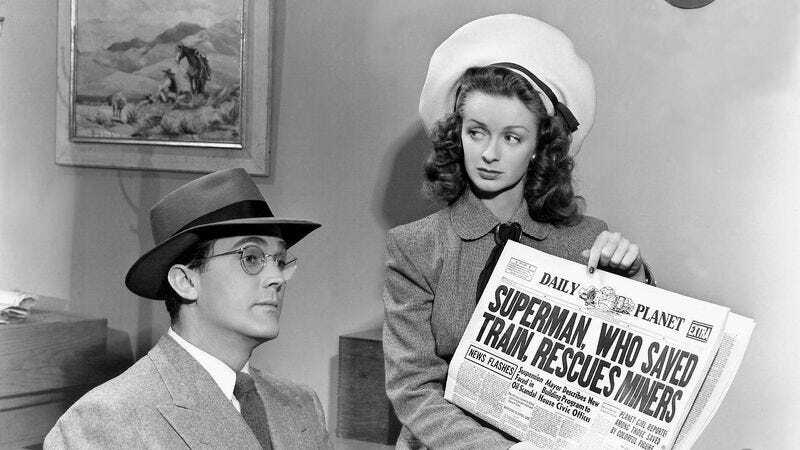 Noel Neill, the first actress to play a live-action Lois Lane, has died at the age of 95. According to Neill’s close friend and biographer Larry Ward, Neill died after a long battle with illness in her home in Tucson on Sunday. The daughter of Minneapolis Star Tribune news editor David Neill and New York vaudeville performer LaVere Neill, Neill was born in Minneapolis in 1920 and got her start in theater when she was 5 years old. After graduating high school in 1938, she moved to California and started singing professionally at a restaurant at the Del Mar racetrack. There, she made connections that led her to the Paramount lot, and she appeared in several small film roles in the ’40s, many of which were uncredited. In 1948, she got her big break. Columbia Pictures borrowed Neill from her Paramount contract for 15 episodes of a comic book-based movie serial about a certain super-strong, super-fast alien who moonlights as a news reporter. Kirk Alyn was cast as the eponymous superhero, while Neill played Lois Lane, Clark Kent’s friend and co-worker at the Daily Planet whose work as a journalist often got her into sticky situations with villains, leaving Kent to change into his Superman gear in a phone booth and swoop in for the rescue. Alyn and Neill reprised their roles in the 1950 serial Atom Man Vs. Superman, which also starred ’30s movie star Lyle Talbot as the first on-screen depiction of Lex Luthor. In these early depictions of the character, Lois Lane is strong-willed and fiercely smart, but she also often found herself fulfilling the “damsel in distress” role in the story. In the television series, Lane eventually develops a crush on Superman and one episode even depicts a dream sequence where she imagines being married to him. After Neill’s death, Coates is now the last surviving main cast member of Adventures Of Superman.